Wendy has been part of the practice for 20 years. She and her family moved to California from Chicago in 1996. She enjoys traveling, art and gardening in her spare time. 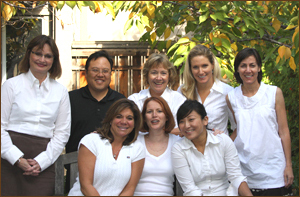 Norlyn joined our team three years ago but has many years of experience in the dental field. She enjoys singing and spending time with her two children. Marfa completed her hygiene training at Foothill College and has been part of our team for 16 years. She grew up north of the Bay Area in Sebastopol, California. In her spare time, she enjoys swimming, cycling and horseback riding. Jennifer has been an RDA for over 15 years and her favorite aspect of working in the dental field is meeting new people. In her spare time, she enjoys running, movies, and spending time with her family. Robin, a graduate of Foothill College, has been a part of our dental team since January 2007. She is also a licensed RDH in the state of Hawaii. Robin grew up in Ontario, Canada, studied business accounting and owned a camera store before moving to the U.S. She has a post-graduate degree in dental hygiene and enjoys sailing, road biking and surfing in Hawaii.